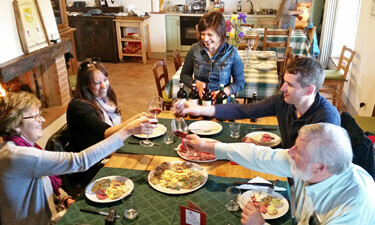 Our Tuscany wine tour from Loro Ciuffenna will include two wineries where we’ll enjoy cellar tours & sit down tastings. As with all my excursions, ample time will be dedicated to admiring the stupendous Tuscan scenery, and of course stops for your holiday photos. 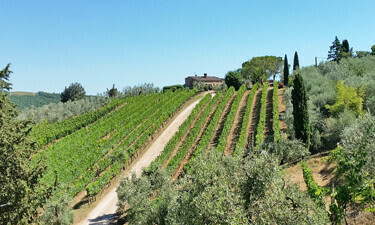 The high lite of the day will be a home cooked farm lunch with paired tasting of Chianti wines at one of the estates. Wines tasted will be mainly reds, including Chianti, Chianti reserve and Super Tuscans. The day will have a leisurely pace, and your travel is strictly private, you won’t be sharing the minivan with others. 09.15am – We set out directly from Loro Ciuffenna and in about forty five minutes reach the region of Chianti where we’ll make a number of stops for your holiday photos. The photos on this page are from the tour. We arrive at our first winery mid morning and you’ll be introduced to the cellars and the world of Chianti by the amiable staff. 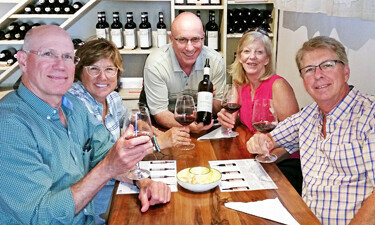 Our stop at the winery lasts about an hour and a half, and you will enjoy a seated and personalized tasting. 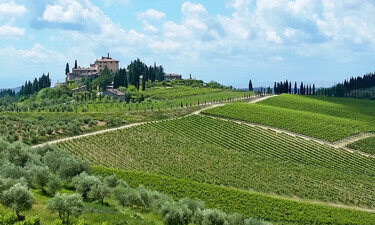 The wines are mainly red consisting of Chianti, and Super Tuscans. Rose’s are produced in small quantities and may be available depending on the time of year. 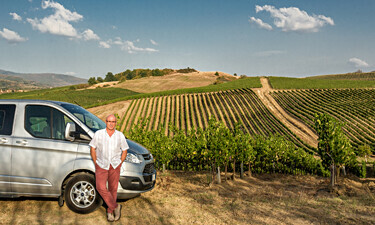 We leave for more photos of the Tuscan countryside, and drive towards our second winery which is a tiny family estate. In fact it’s one of the smallest in the Chianti region. Here we’ll have a guided tour of the cellars, followed by a delicious home cooked lunch. Your meal will be prepared by the owners wife who isn’t a chef…just a great cook as you expect an Italian lady to be. It’s a nice change nice to get away from restaurant food (however good) and sample what we eat at home. Of course you’ll be sampling the estate’s Chianti & Super Tuscan wines with your meal. Last but not least, the winery has gorgeous views which you’re sure to enjoy. Our stay will be leisurely and last about two hours. If time permits and you’re not too tired we still have a photo or two to take, than we head back to Loro Ciufenna where we arrive at approx 05:00pm. For more info you can also look up my premium tour.